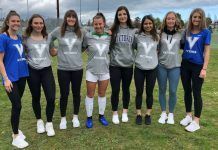 KAMLOOPS, BC—A soccer player who led his team to a national medal and a volleyball player who was a consistent offensive threat in each match have been honored as the Athletes of the Year by the Thompson Rivers University WolfPack for 2017-18. Mitchell Popadynetz (4th year, midfield, Nelson, BC) and Rachel Windhorst (4th year, outside hitter, South Surrey, BC) were honored at the WolfPack’s annual wind up banquet held Thursday (Mar 29) at the Campus Activity Centre’s Grand Hall. Both were awarded the Sports Task Force award. Popadnyetz was the Canada West player of the year, a Canada West first team all-star, USPORTS 1st team all-star, all-star at the USPORTS Nationals at Hillside Stadium where he led his team to a bronze medal. He was the leading goal scorer in Canada West and third overall in USPORTS while having one of the greatest seasons in TRU men’s soccer history. He was selected over fellow finalists volleyball player Tim Dobbert (4th year, outside hitter, Aichelberg, Germany) and basketball player Luke Morris (5th year, forward, Mission, BC). Windhorst played two seasons with the WolfPack after transferring from St. Mary’s University in Halifax, Nova Scotia. She finished sixth in the Canada West in total kills (327) and eighth in kills per set (3.41). Rachel finished in the top 20 in digs (238) good for 2.43 per set while playing in all 24 matches for the WolfPack this season. “Her willingness to put in the time in the off season and her high level of compete were great additions to our program and she will be missed as we move forward,” said her coach Chad Grimm. Runners up were: Michelle Bos (4th year, forward, Surrey, BC) of basketball and Marisa Mendonca (3rd year, midfield, Penticton, BC). Both Windhorst and Popadynetz’s teammates also captured major awards. Ryan Glanville (5th year, midfield, Williams Lake, BC) and Kendra Finch (3rd year, outside hitter, North Vancouver, BC) both won the Doctor Roger H. Barnsley Scholar Athlete award. Glanville is a multi-winner of the USPORTS Academic All Canadian award. This past year , he was a Canada West 2nd team all-star and all-star at the USPORTS soccer nationals. He will graduate this spring with a Masters of Business degree while maintaining a job and raising two young children. Finch ended up the season in the top three in Canada West in digs (358) as well being the primary serve/receiver for the WolfPack. She was the top player on her team in digs and fourth in point scored. She was a team leader while continuing her studies in the Bachelor of Science program. Runners up for the Barnsley award were: Breena Rusnell (3rd year, Fort McMurray, AB) in swimming, Emily Vilac (4th year, forward, Kamloops, BC) of women’s basketball, Cole Keddie (4th year, outside hitter, Edmonton, AB) in men’s volleyball and Michael Rouault (3rd year, guard, Vernon, BC) of men’s basketball. The Cliff Neufeld leadership Athlete of Year award which combines athletic performance and community work was awarded to Rouault and volleyball’s Kaitlin Lomas (5th year, middle, Ponoka,AB). Rouault was a team captain, second on the team in rebounds (162 and 8.1 rebounds per game).He led the team with assists (41) and steals (25). He is looking to be a three time USPORTS Academic All-Canadian, and led the PACE student-athlete academic assistance program. Lomas was a five year starter with the volleyball program and was the top attacker with a hitting percentage of 0.227. She also worked with the PACE program, volunteered three hours a week at the campus wellness center, was on the captains council while completing her psychology degree with honors. She also spearheaded an initiative to bring awareness of support for victims of sexual violence. Other finalists for this award were: swimmer Gurcharan Uppal (1st year, Kamloops, BC) and Christine Fergin (4th year, defender, Waterloo, ON) of women’s soccer, Conlan Sprickerhoff ( 5th year, Williams Lake, BC) from cross country and Glanville. For the first time since its inception, the “newcomer award” has been broken into a male and female athlete. Defender Jan Pirettes Glashmacher (Barcelona, Spain) was the male winner. A Canada West all-rookie selection as he transferred from Virginia Tech. 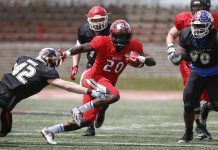 He quickly became one of the top defenders in both Canada West and USPORTS. Jan was involved in a number of the teams community initiatives including Raise a Reader and Toys 4 Kids. Other finalists were Tyus DeVries (guard, Chilliwack, BC) of men’s basketball and Landon Currie (libero, Vernon, BC) from men’s volleyball. The female newcomer of the year was Yevgeniya Nyukhalova (outside hitter, Severodontsk, Ukraine) of women’s volleyball. She was tied for the Canada West lead in kills (352) and finished second in kills per set (3.74). She led the WolfPack with 4.2 points per set this year and was third on the team in digs (191). Jordon Haggerty (guard, Saskatoon, SK) of women’s basketball and Camryn Curts (midfield, Courtenay, BC) from women’’s soccer were the runners up. Sprickerhoff, Windhorst, Glanville, Keddie, Lomas, Morris and Fergin were just some of the WolfPack’s graduating athletes recognized at the banquet. Others completing their academic or athletic programs this year are: Shenise Sigsworth (women’s basketball), Corryn Brown (curling), Erin Pincott (curling), Jordy Cunningham (baseball),Regan Gillis (baseball), Josh Hillis (baseball), Alan Connor (men’s soccer), Brandon Mendez (men’s soccer), Colton Walker (men’s soccer), Samantha Sonnenberg (women’s volleyball), Carly Gunter (women’s volleyball), Alex Cassels (men’s volleyball), Randy Grundmann (men’s volleyball), Jordan Foot (men’s volleyball), Rachel Lobay (cross country), Gabe Carpendale (cross country),Nik Rampen (cross country), Faryn Brown (cross country) and Emily Atherton (cross country). The WolfPack also honored the TRU curling team: Samantha Fisher, Dezaray Hawes, Pincott and Brown for winning their third USPORTS Silver medal at Nationals this past week.